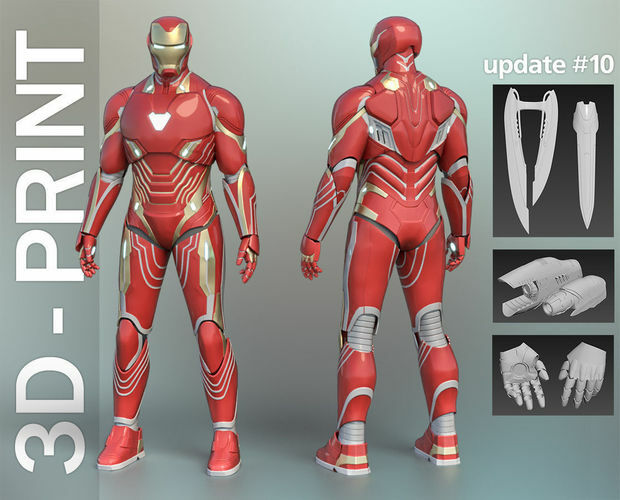 Mark 48/50 Infinity War 3D-model, wearable suit for 3D-printing, DIY. Update #10 - added swords, guns, revised palm. Suit adopted for wearing for typical adult. Default height - 185cm (good for 175-185cm height). Set of STL files, clean of errors, ready to print. ZIP packages include all parts shown in preview pictures +video instructions of cutting and resizing. All small arcs comes as separated pieces, better to print of transparent filament. NOT for resale or sharing. Only for personal use.